The Buffalo Bills by virtue of their 24 – 16 win over division rival the Miami Dolphins are one step closer to securing their first playoff appearance since 1999, but still aren’t quite there. 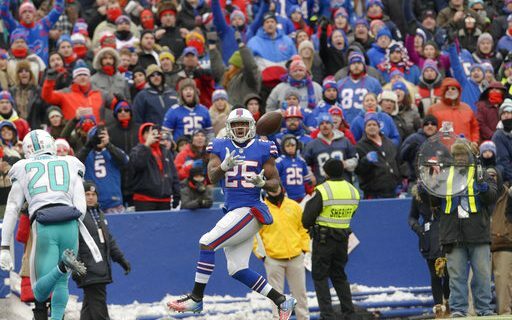 The win over the Dolphins helps the Bills in that it is both a division and conference win. If they finish tied with the Baltimore Ravens for the final playoff spot, the Bills will be in because of their better conference record. Regardless of what the tie breakers are, it’s really a simple formula…just win and you’re in! The Bills have the more difficult schedule, having to play both of their final games on the road. Next Sunday they have to play at New England, and the following week they have a repeat matchup at Miami. With New England winning yesterday at Pittsburgh in one of the most exciting games of the year, the Pats have clinched a Playoff spot, but that’s it. They are tied with the Steelers for the best record in the AFC at 11-3, but right now hold the first seed slot because of their win yesterday. Al that changes with a loss and it could even mean not having a first round bye. That means the Patriots won’t be resting anyone next week against the Bills as they need the win as much as the Bills do. Baltimore has an easier schedule the rest of the way, having to play both the Colts and Bengals at home the next two weeks. Both of those teams are playing poor football right now. In fact Cincinnati looks as if they have packed it in following their physical loss to Pittsburgh three weeks ago. They have been blown out the last two games losing to Chicago 33-7 last week and the Vikings 34-7 yesterday. Looking back at the Bills win yesterday, they had another strong performance especially by the defense. They gave up 349 total yards, but also sacked Jay Cutler three times and forced three turnovers all being interceptions. Looking ahead, the Bills still need to show improvement on the offensive side of the ball. Yesterday LeSean McCoy may have reached the 10,000 milestone in rushing yards for his career, but was only able to manage a total of 50 yards on 20 carries. The Bills had just 116 yards on the ground including 42 by quarterback Tyrod Taylor. As has been the case all year, Taylor was efficient as a passer completing 17 of 29 throws for 224 yards and a touchdown but many of those total yards came on runs after the catch. The Bills are still struggling to get the ball to their wide receivers. Only four of the Taylor 17 completions went to wide receivers and for only 57 yards. If the Bills want to beat New England, this has to change. Buffalo traded for Kelvin Benjamin at the trade deadline to give Taylor a big possession receiver. Yesterday he caught just two passes for 20 yards, and was targeted only those two times. For the Bills to be effective, Benjamin needs to be targeted seven to eight times a game. I don’t want to be the pessimist in the crowd, but with next week’s game being important to New England I don’t feel the Bills have even a slight chance of winning unless Taylor can dramatically change his style of play.